This book is exciting and full of intense scenes. I experienced a various emotions while reading but mostly I felt sad for there were people who had an unacceptable death. Too many people sacrificed just for the sake of freedom. I had to stop in some chapters because I just can't take the fact that those scenes happened. I had these reactions while reading and gonna stop and said "NO!" or "OMG" or "THAT DIDN'T HAPPEN". I love the book like I loved the first two books (Taken and Frozen) I got hooked to the trilogy for it tackled about the rebellion and trying to have a peaceful society. At this book, too many happened before they had the freedom they have been wanted for so long, the truth that they've been aiming for to be revealed. Adventurous but challenging is how I will describe about the every scenes. Aside from that, the romance between Gray and Bree, it was a good one to be honest. I like their tandem. Both has strong personality but deep inside is someone that cares a lot, tho I miss the Gray and Emma story, still the book ended up with a good romance story too. All in all, the book is awesome. The book ended up with a good story. Freedom, peace, love and friendship was all there to remember. Erin is represented by Sara Crowe of Harvey Klinger. 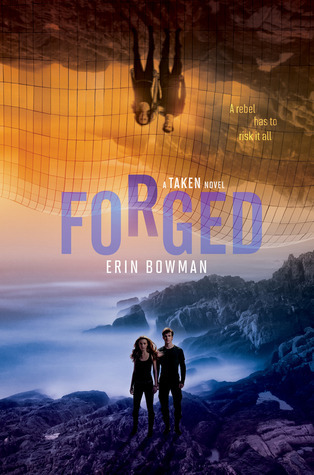 She is the author of TAKEN, FROZEN, and FORGED (4/14/15) from HarperTeen. VENGEANCE ROAD is forthcoming from HMH (9/1/15). PLEASE NOTE: I do not check goodreads mail. If you message me this way I will not only not see it, but I certainly won't answer it. For contact methods more likely to receive a response, check my website.